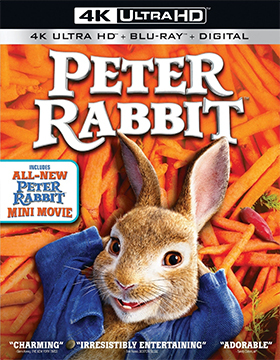 Sony Pictures Home Entertainment announced this past week that Peter Rabbit will be available on May 1 as a three-SKU array of home entertainment products — DVD, Blu-ray/DVD Combo Pack and a 4K Ultra HD/Blu-ray Combo Pack edition. The knives came out early when the film opened theatrically in early February of this year with an incredibly stupid claim that writer/director Will Gluck’s Peter Rabbit was replete with elements of bullying. Likely the same bunch of media chuckleheads that claimed that director Lasse Hallström’s A Dog's Purpose featured animal abuse. Nonsense and double-nonsense!! The jokes and sight gags in Peter Rabbit come a mile-a-minute and the film works as both a kid’s tale and an adult comedy … and, get this (or is it “take that”), audiences voted at their local multiplex in favor of Peter Rabbit to the tune of $110.8 million in box office receipts. For the record, Peter Rabbit is hopping to market with a zippy ARR of just 81 days. That’s “jack-rabbit” fast!